Sen. Bernie Sanders (I. Vt.) pledged on several phone calls to stand by Rep. Ilhan Omar (D., Minn.) as she navigates the anti-Semitism quandary she's created, according to reports Thursday. Jewish Insider reported Thursday morning that Sanders, who is Jewish, shared his support with participants of on an off-the-record conference call. "I talked to Ilhan last night to give her my personal support," Sanders reportedly said. "We will stand by our Muslim brothers and sisters." Jim Zogby, the host of the call, declined to provide any other details. Zogby is co-chair of the DNC’s Ethnic Council and founder of the Arab American Institute. Omar has been under scrutiny this week after she wrote a series of ill-advised tweets concerning Jewish Americans, Israel, and the United States government. Omar peddled in anti-Semitic stereotypes, mischaracterized a pro-Israel lobbying group, and garnered praise from the former Grand Wizard of the Ku Klux Klan. In a tweet Sunday afternoon, Omar shared a tweet from far-left journalist Glenn Greenwald. Greenwald claimed McCarthy was "defending a foreign nation' and "attacking free speech rights of Americans." In reply, Omar claimed elected officials acted for Israel out of financial interest. "It's all about the Benjamins baby," she said. The reference is to $100 bills, which have Benjamin Franklin's face on the front. When asked who she thinks "is paying American politicians to be pro-Israel," Omar replied, "AIPAC!" AIPAC, the American Israel Public Affairs Committee, is not a political action committee (PAC). It is prohibited by law from donating to candidates and neither rates nor endorses candidates for office. Speaker of the House Nancy Pelosi (D., Calif.) and Democratic House leadership condemned Omar for her "deeply offensive" remarks, and President Donald Trump called for her resignation. Omar remains a member of the powerful House Foreign Affairs Committee, a position Pelosi could revoke. On Monday Omar, who is 37, offered a conditional apology for again using "anti-Semitic tropes" and pledged to continue to learn more about the issue. She finished her statement by invoking AIPAC by name and challenging its "problematic role" in politics. Sanders stood by Omar in the Wednesday call. Omar's office confirmed to the Daily Beast Thursday that the two had spoken directly, but declined to provide detail as to the content of the call. "A source familiar with the conversation confirmed … that Sanders expressed support for Omar," the Daily Beast reported. The Free Beacon is unaware of any public comment from Sanders concerning Omar or anti-Semitism since she made her comments. 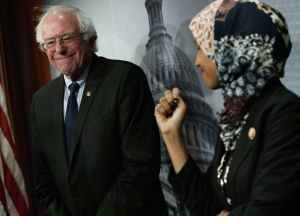 In the meantime, the report of Sanders's support for Omar prompted joy from those on the left who saw criticism of Omar's comments as the problem, rather than the comments themselves. Jewish Insider‘s Adam Rubenstein pointed out that Omar is now raising money on the anger at the comments she herself has described as anti-Semitic. An advertisement published on Facebook promises Omar "will not be silenced," encouraging supporters to donate to her campaign.